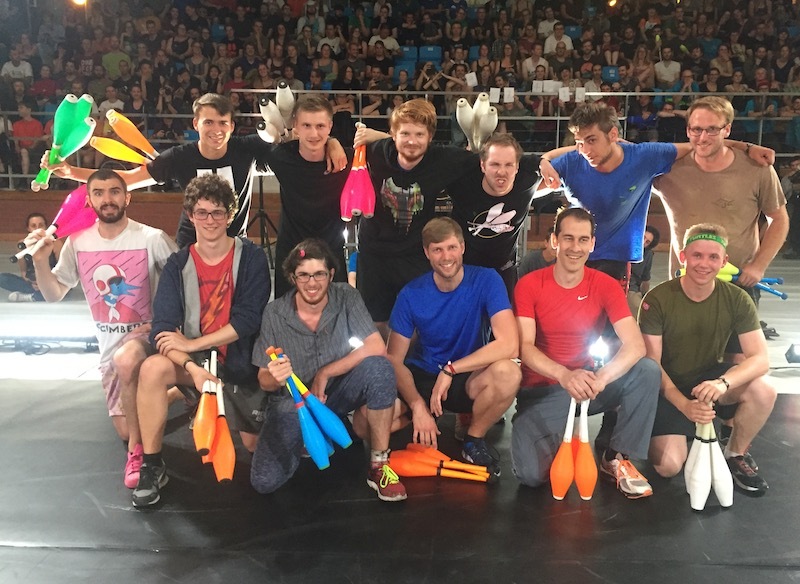 The EJC 2017 Fight Night in Lublin was the second biggest tournament of all time, with 89 jugglers taking part (down from 98 in Almere last year). Lots of rankings points could be won, even for those outside of the top 32 who qualified for the knockout, so a lot has changed in the 2017 Race Rankings. The Race Rankings only counts tournaments so far this year. Jochen Pfeiffer won the entire tournament, extending his current winning streak to 33 matches, now the longest winning streak in the official Fight Night records. He earned 1250 points, just enough to propel him to the top of the 2017 Race Rankings with 1725 points in total. By winning the third Major Tournament of the year, he's also guaranteed an invite to the European Masters 2017 End-of-Year Finals in Berlin in December. Matty Schneider and Luke Burrage, the other two Major Tournament winners this year (BJC and NJF), are still in second and third place in the 2017 Race Rankings. Either could have stayed ahead of Jochen, and either could be at the top of the rankings, but Luke lost his opening match at the EJC to Sebastian Martini, in the biggest upset of the tournament. Matty went out in the round of 16, losing to Julius Preu. Strong results at the EJC from Markus Utke (3rd place) and Leo Ostenrath (4th place) means they are at 4th and 5th in the race, within just 100 and 200 points of Luke. Both Cameron Ford and Brook Roberts failed to make it out of the qualifications, but they both earned enough points to stay in the top 10 of the Race Rankings at 6th and 7th. Andreas Braun, with his run to the final match at the EJC, defeating Wes Peden and Leo Ostenrath on the way, is up to joint 9th place alongside Julius Preu, both with exactly 1000 rankings points. Rounding out the top 10 in the race rankings is a juggler who wasn't at the EJC this year. Ian Deady has 675 points so far in 2017, but both he and Andreas will have to enter one more tournament to be eligible for an invite to the European Masters in December. Other jugglers with strong results at the EJC compared to their rankings are Rob Woolley, who reached the round of 16 and climbs to 16th in the 52 Week Current Rankings, and Isabell Stroben, who qualified at the EJC and enters the top 25 for the first time. The biggest tournament of the year done! If you missed any of the action, this is the place to catch up with videos from the event. Otherwise you can experience the whole event, from qualifications to the aftermath of the main event, by watching the following three videos. Lots of videos! Hope you enjoy them! The EJC Fight Night is coming up tomorrow, so now is the last chance to catch up on the two Pre-EJC warmup tournaments! In Berlin, Katapult hosted a Fight Night as part of their PRE-EJC Warmup Week. Only six jugglers took part, but all except one had won a Fight Night before, and the last had been in a final. Florian Marienfeld kept up his streak of losing to Jochen Pfeiffer in semi-finals, and then lost to Eóin Allan in the third place match. The final featured Jochen and Luke Burrage, with the predictable result. Jochen earned himself 175 rankings points and stays at the top of the 52 Week Current Rankings. He also extended his winning streak to 28 match wins in a row, matching his previous record of 28 match wins in a row. Let's see if that continues at the EJC. Last year the Pre-EJC passing convention was called CoastCon, due to it being held on the coast of Germany. This year it was held in Göttingen, but it's still called CoastCon for Fight Night purposes. 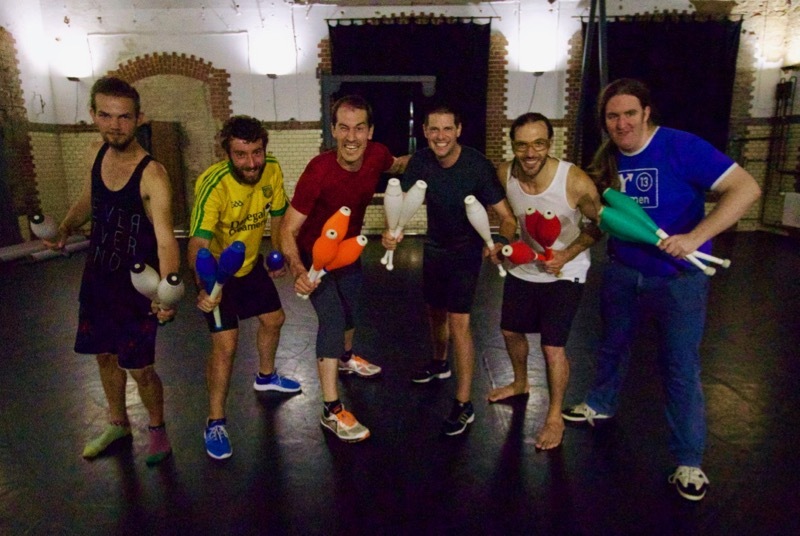 This year 12 jugglers took part, and first-time Fight Night Combateer Ofek Rafaeli took the title, long with 250 rankings points, by beating Lars Lehmann in the final match. Thanks to Nicki Cohrs for organising the tournament. Stay tuned for updates from the EJC after qualifications tomorrow, and maybe a live stream of the finals!